Rock On The Range--the largest and most-acclaimed rock festival in the United States--celebrates its 10th Anniversary May 20, 21 & 22, 2016 at MAPFRE Stadium in Columbus, OH. The incredible lineup features the legendary Red Hot Chili Peppers, hard rock titans Disturbed (who have returned after a 4-year hiatus), and rock icon/filmmaker Rob Zombie topping a lineup that’s packed with rock royalty such as Shinedown, Five Finger Death Punch, Bring Me The Horizon, A Day To Remember, Megadeth, At The Drive-In, Lamb Of God, Sixx:A.M., Hellyeah and Pennywise, along with the genre’s hottest developing artists. "Rock On The Range is easily one of the best festivals I've ever played. Looking forward to doing it again," says ROB ZOMBIE. 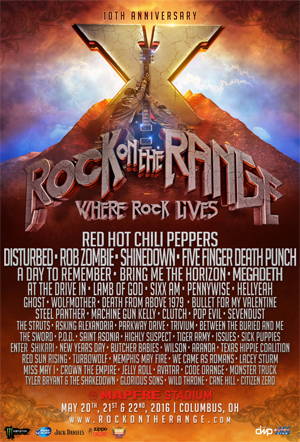 The current band lineup for Rock On The Range--fueled by Monster Energy--is as follows: Red Hot Chili Peppers, Disturbed, Rob Zombie, Shinedown, Five Finger Death Punch, Bring Me The Horizon, A Day To Remember, Megadeth, At The Drive-In, Lamb Of God, Sixx:A.M., Hellyeah, Pennywise, Bullet For My Valentine, Steel Panther, Ghost, Wolfmother, Death From Above 1979, Machine Gun Kelly, Clutch, The Struts, Sevendust, Pop Evil, Asking Alexandria, Parkway Drive, Trivium, Between The Buried & Me, P.O.D., Saint Asonia, Issues, Highly Suspect, The Sword, Tiger Army, Sick Puppies, New Years Day, Aranda, Wilson, Enter Shikari, Butcher Babies, Texas Hippie Coalition, Red Sun Rising, Memphis May Fire, Lacey Sturm, Turbowolf, We Came As Romans, Miss May I, Crown The Empire, Jelly Roll, Avatar, Code Orange, Tyler Bryant & The Shakedown, Monster Truck, Glorious Sons, Wild Throne, Cane Hill and Citizen Zero, with more to be announced. Rock On The Range specially priced weekend presale tickets are available now. Visit the ROTR Facebook and Twitter pages for a password to purchase these tickets (Weekend Field GA: $199.50 + fees, Weekend Stadium GA: $99.50 + fees). Layaway Packages, VIP tickets, Camping, Hotel Packages, and Weekend Stadium GA Ticket 4-Packs ($349 + fees) are also available for purchase at www.RockOnTheRange.com.